"Atmospheric jazzy songs and crystal clear vocals ." Bird in a Glasshouse is anything but a typical singer-songwriter. Instead of a guitar or piano, she performs on a violin which she even uses as double bass and percussion instrument. Bird in a Glasshouse, alias Femke Ravensbergen makes pop-folk with a touch of jazz and trip hop. 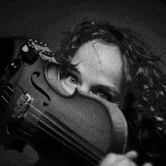 For this she uses a violin, small instruments and a computer. With her clear voice and acoustic instruments, Femke creates her own world. Texts and stories were gathered on her many travels from the farmland of Drenthe in the Netherlands to South America and came back with her to Amsterdam. Musical trips she made through Italy, Spain and Croatia with the folk- swing band Amarins & le gatte negre. The result is a musical atmosphere that is mysterious, powerful and joyful. "Writing songs is the best there is. Sometimes I fall in love with a song and play it again and again. Then I know it's a good song.” In between writing songs Femke prefers to work with her hands. In her self-built workshop she creates objects for theater of wood, steel and carbon fiber. "I find it magical when suddenly 'something' comes from 'nothing', I have the luck to live in a creative community where that happens all the time." Femke's great example is Fink, "I hope one day I can record a song with him!” With her fresh debut EP in her pocket she played at festivals throughout the Netherlands, she performed as opening for Kraantje Daddy at Oerol, the Netherlands, and won the finals of the National Dutch competition Art Rocks at Eurosonic-Noorderslag 2015.